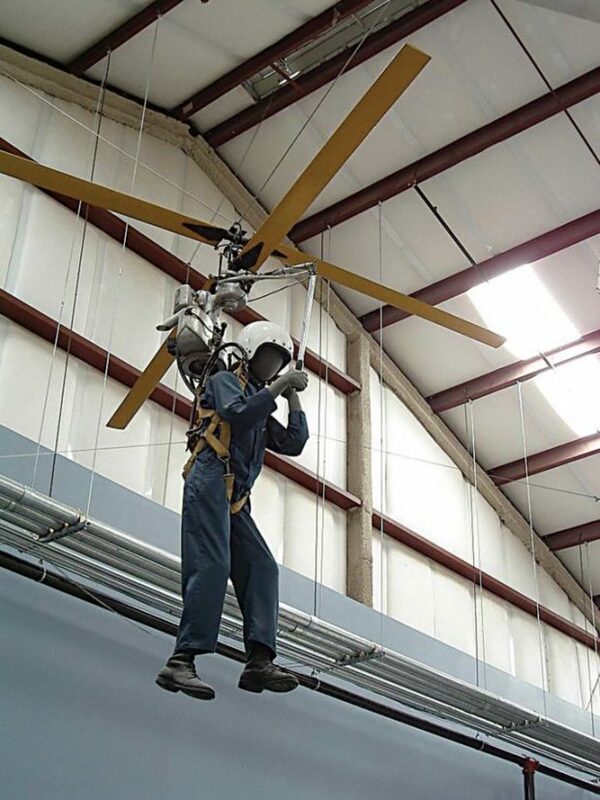 As World War II drew to a close, before the first roots of the civil commercial rotary-wing industry in the United States had begun to take hold, a young Washington-based inventor had began dreaming of a small, single-person light helicopter that would offer the ultimate in portability. Born in 1909 in Schenectady, New York, Horace T. Pentecost studied mechanical engineering at Purdue University. After beginning his professional career with the Socony Vacuum Oil Company, and then joining the engineering department at the General Electric Company, he arrived at the Boeing Aircraft Company in Seattle, Washington, in 1943. Much of his work with Boeing was classified, but he eventually specialized in the design of rotary-wing aircraft. In his spare time, he began looking at the novel idea of a one-person helicopter that could be strapped on like a backpack. Pentecost could see how useful it would be for the military to be able to quickly transport individual soldiers over inaccessible areas, and felt a backpack-style helicopter would be simple to fly, and could be operated in a safe manner over short distances. Pentecost left Boeing in December 1945 to further the design and development of the helicopter – which would ultimately become known as the Model 100 HX-1 Hoppi-Copter — forming Hoppi-Copters Inc. at the Boeing Field in Seattle. The first Model 100 had a 20-horsepower engine that powered two coaxial counter-rotating 12-foot (3.6-meter) wood rotor blades. The system was attached to the pilot through metal tubing and canvas straps on his or her shoulders, and weighed about 90 pounds (40 kilograms). The pilot controlled the direction of travel through an overhanging cyclic stick that had a twist grip for collective pitch to maintain yaw control, while the throttle control was located on the left shoulder strap. The unique backpack helicopter had no landing gear — other than the pilot’s legs. Pentacost emphasized that the Hoppi-Copter was not a toy, but a miniature rotary-wing aircraft of an advanced design. And, at the first public showing of his portable helicopter at the World Inventor Exposition in Los Angeles, California, in July, 1947, Pentecost was awarded second prize. But despite recognition of the ingenuity of his design, only about 20 tethered flights of the Model 100 ever took place. Pilots found it was very sensitive and extremely difficult to fly, so no free flights were even attempted. Added to this was the fairly major consideration of what might happen should the pilot trip or fall while the aircraft was running — with the potential risk that the rotor blades could strike the ground, a nearby object, or the person attempting to fly it. Pentecost decided to abandon the Model 100 as a backpack-worn aircraft, and got to work redesigning it with landing gear. The new Pentecost Model 101 incorporated the main feature of the Model 100 — the coaxial counter rotating wood blades — but had a single seat for the pilot above tubular tricycle-style landing gear. This new Hoppi-Copter was designed to meet the widespread market for civilian use as an inexpensive utility helicopter. Pentecost then revised this version with engineering improvements to create the Model 102. He built three of these for use in flights under the direction of the Civil Aeronautics Authority. 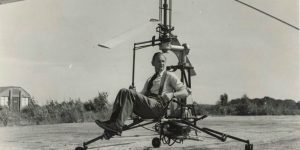 The new Hoppi-Copters were developed with the assistance of Richard Prewitt, the former vice president and chief engineer of the Kellett Aircraft Company in Pennsylvania. 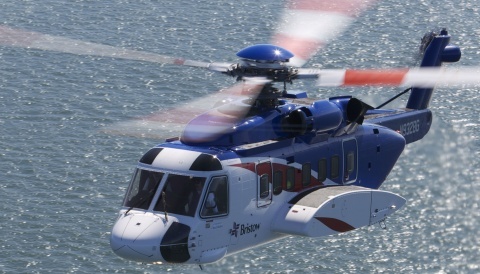 Prewitt was retained to assist in the design of the Hoppi-Copter production model. He said that the Model 102 appeared entirely feasible, and that such a helicopter would have widespread utility in many fields. It was planned to be the company’s first marketable product, with an estimated price of around $1,000. The Model 102 had an open light tubular frame with a seat and a foot rest, and the pilot was secured by a safety belt. Started by pulling a cord wound around a flywheel, the aircraft had a 20-horsepower two-cylinder air cooled engine, designed by Pentecost, that had a fuel capacity of just seven pints. The aircraft’s counter-rotating wood rotor blades had a diameter of 16 feet (4.9 meters), enabling it to land or take off in a cleared area as little as 30 square feet (2.8 square meters) in size. Its empty weight was about 100 pounds (45 kilograms), but it was capable of lifting a useful load well over its own weight. The three Model 102 Hoppi-Copter prototypes carried out more than 100 captive and free flights, recording the type’s first indoor flight on Aug. 2, 1947, and its first outdoor flight on Jan. 12, 1948, at Bow Lake, Seattle-Tacoma Airport in Washington. The pilots for the pioneering flights were Kermit Jones and Maurice Ramme, but they were limited to about 10 feet in altitude with a speed of 18 miles per hour. Hovering was kept to about three minutes at a time. Jones and Ramme stated that the maneuvers were simplified by a single-stick reaction-type control stick, which permitted the Model 102 to move straight up and down, and forward or backward. The engine was later upgraded to 35 horsepower, with power supplied through a two-stage geared transmission turning the coaxial counter-rotating blades. permitted a safe descent and power-off landing. 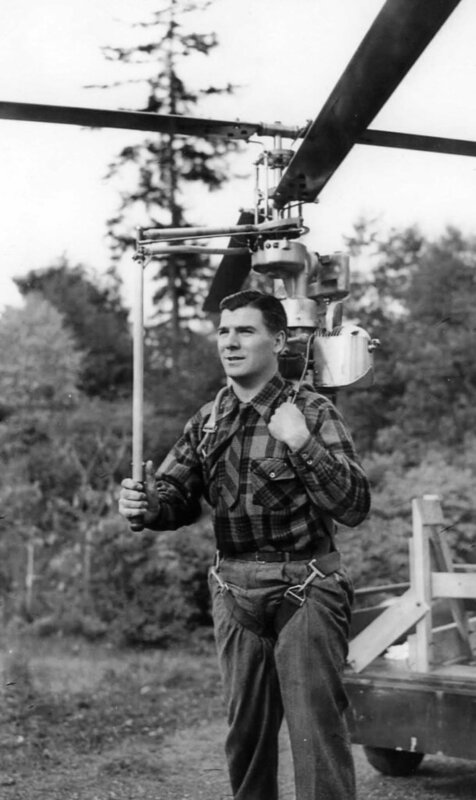 He saw the Hoppi-Copter being used by surveyors, miners, hunters, prospectors, photographers, trappers, for forest and border patrols, and even used in crop-dusting. A Hoppi-Copter was even tested by the U.S. Air Force at Wright Field in Ohio, and the type was exhibited at the Civil Air Patrol Air Show staged by the Army Air Force in Renton, Washington. 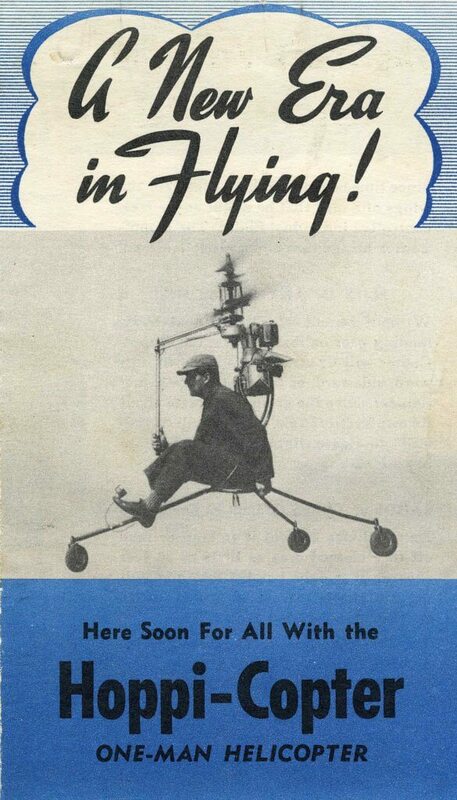 Pentecost also envisioned the development of a light, enclosed, two-passenger, inexpensive Hoppi-Copter called the “Coupe-Copter.” He felt that the Hoppi-Copter was the most versatile aircraft ever designed, and would introduce a new era in flying. He claimed his design opened up new horizons for business, pleasure, and public service. In 1948, Pentecost accompanied two Model 102s shipped to England for evaluation. 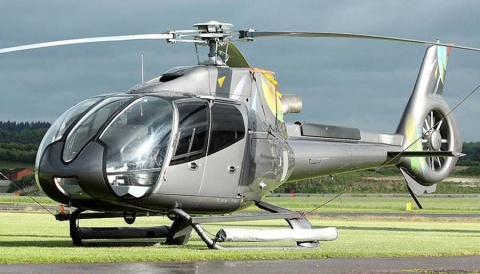 The plan was for one to be tested by the Royal Air Force Research, Development and Training Unit for rotary-wing aircraft at Beaulieu by experienced helicopter pilot S/L F.J. Cable. The other Model 102 was to be used for the possible development and manufacture of the Hoppi-Copter in the U.K. While no action was taken in starting an English operation — either civilian or military — at the time, the Hoppicopter Company formed in Bournemouth, England, in 1950. The plan was to manufacture the aircraft for export all over the world. The company was nothing if not ambitious — they hoped to eventually manufacture 850 units a month. But no Hoppi-Copters were ever built. Applications for dealerships came from all the states in the U.S., as well as from 24 countries. Even missionaries in Malaysia, Borneo, and East Africa showed an interest. 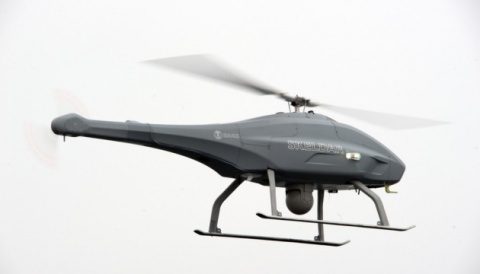 The company had applications on file for over 1,300 Hoppi-Copters, with most customers wanting immediate delivery. 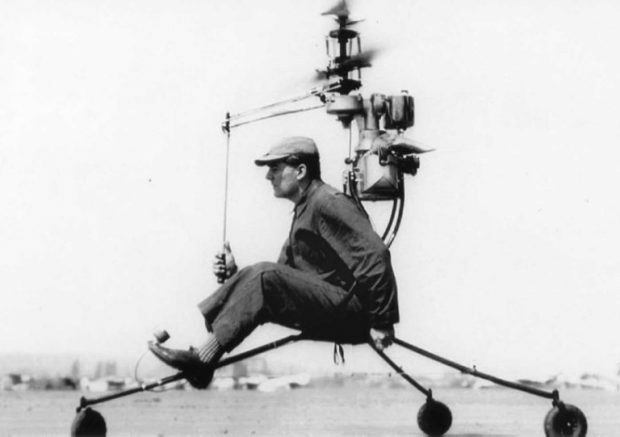 At one point, the future looked promising for the versatile Hoppi-Copter, but by 1949, its design had gone through several variations without resulting in a production model being ready for sale. During this same period, the Bell Aircraft Corp., Sikorsky Aircraft, and Hiller Helicopters all had developed civil helicopters for sale — albeit much larger than the single-place Hoppi-Copter. And there were no military sales or research contracts for the aircraft, either. The military did not see the one-place Hoppi-Copter as a replacement for transporting the lone infantry soldier where needed on special missions. Pentecost lost control of his company about the time the Hoppi-Copter was to go into production. American Hoppi-Copters, Inc. of Washington, D.C. was later formed to try and start up the production of the aircraft, but the company failed. Pentecost attempted to start another new company, called the Capital Helicopter Corp., in January 1954. 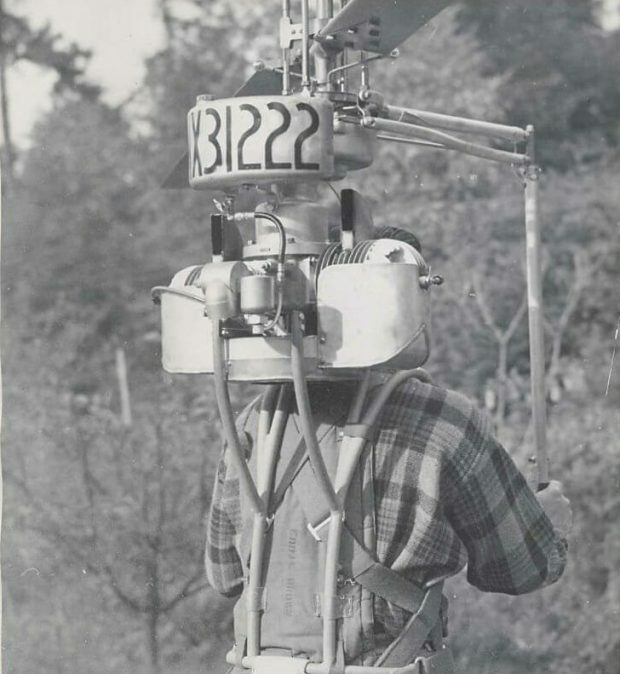 He planned to use his C-1 Hoppi-Copter, and was able to get his patents back for the aircraft. He designed and eventually flew a new version of his Hoppi-Copter, powered by small pulse jet engines on the rotorblade tips. However, success was not to be for Pentecost, and this company also failed. This spelled the end for his vision of a light one-place helicopter industry. As it happened, the U.S. military did become interested in a light single-place helicopter later in the 1950s — but it was well after Pentecost had left the helicopter industry. The prototype backpack Model 100 was donated to the Smithsonian Institution/National Air and Space Museum in Washington, D.C. in 1952. Today, it is on display at the Pima Air and Space Museum in Tucson, Arizona.